Dundee United have signed former Ivory Coast midfielder Guy Demel until the end of the season, subject to international clearance. France-born Demel was released by West Ham in June after making 83 appearances in four seasons. The 34-year-old has also had spells at Arsenal, Borussia Dortmund and Hamburg. He told the club's website: "Once I spoke to the head coach, I was excited by the challenge of Dundee United and the role he has planned for me." United manager Mixu Paatelainen said: "Guy comes with a lot experience and fantastic pedigree. "He can add a lot to our squad. He is a powerful player, but above all a good footballer. "He will be a strong character in our dressing room and I am delighted to start working with him." Primarily a defensive midfielder, Demel was capped 35 times by Ivory Coast, played in the Africa Cup of Nations twice and was included in the World Cup squads in 2006 and 2010. He retired from international football in 2012. "I want to identify myself with the club," said Demel, who played only six games for West Ham last season. "I have many years of experience in football and, if I can use my knowledge to help the younger players here, that is what I will do." 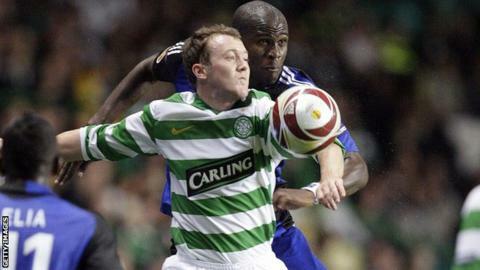 Demel was part of the Hamburg team that beat Celtic 1-0 in Glasgow in the Europa League in 2009.